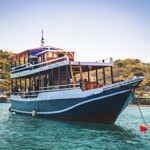 At Mikumba Diving we aim to give you an unforgettable experience with daily diving trips and our budget and mid-range liveaboards in some of the best diving spots in the world – Komodo National Park & Raja Ampat. We are also a PADI dive centre offering all courses from Discover Scuba Diving up to Divemaster. We operate all year round in Komodo where we encounter stunning healthy coral reefs, ridiculous amounts of colourful fish, graceful sharks and majestic mantas. From November to April Mikumba Diving takes adventurous divers to spectacular scuba diving paradises with our budget liveaboard in Raja Ampat, Ambon, Alor and other locations in the Banda Sea. You can charter our boats for your diving group or book spaces individually to enjoy snorkelling, diving, beach walks, and delicious food. Conservation and our local community is very important to us at Mikumba Diving. As well as being a PADI dive centre we are also involved with Shark Guardian, the Marine Megafauna Foundation, Barefoot Conservation and Coral Guardian. See our Conservation page for more information. At Mikumba Diving we aim to give you an unforgettable experience with daily diving trips and our budget and mid-range liveaboards in some of the best diving spots in the world – Komodo National Park & Raja Ampat. Join us on this epic crossing as we set sail from Raja Ampat back to Maumere, Flores. We cruise through some of the most famous dive sites in the world, Misool, Banda Islands and Alor, and pass dozens of unexplored locations. We visit uninhabited islands and dive in places that no one has ever dived before. We will be heading back to Raja Ampat from Flores on 10th November 2019 for another amazing 19 day / 18 night crossing. Experience the beauty of the Komodo National Park, visit the Komodo Dragons on Rinca Island and see the flying foxes at dusk on the mangrove island of Kalong. From November to April Mikumba Diving operates liveaboard cruises around some of the best spots in Raja Ampat. From macro to majestic mantas, there’s something for everyone. Mikumba Diving is at CHC @ Suntec Conventional Hall.